Posted February 23rd, 2014 by Gerry La Rocca & filed under Accounting Careers, Canadian Economy, Corporate Restructuring, Corporate Social Responsibility, Fraud, Fraud Accounting, Taxation, Taxation & Planning. 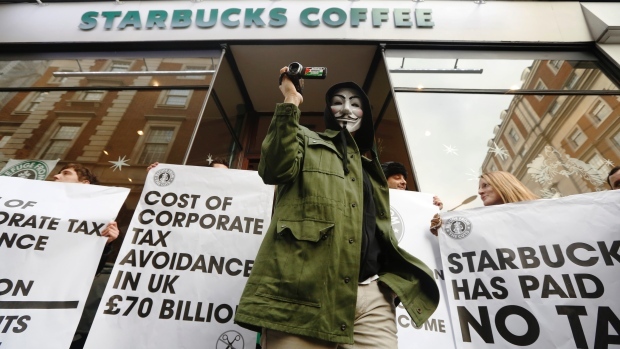 In December 2012, demonstrators led a country-wide protest against Starbucks over the coffee chain’s tax evasion tactics. “I am proud to be paying taxes in the United States,” radio DJ Arthur Godfrey once said. “The only thing is, I could be just as proud for half of the money. That’s certainly been the attitude of many companies of late. In a banner year on the stock markets, multinational corporations seem to have redoubled their efforts in 2013 to keep as much of their profits from the taxman as possible. U.S. think-tank the Public Interest Research Group recently calculated that the amount of profits being held in Bermuda by America’s 100 largest companies was more than 10 times the island nation’s entire GDP.For decades, multinational corporations have used tax havens like the Cayman Islands, Bermuda, the Isle of Man and Luxembourg to shield profits from tax authorities without running afoul of the law. More and more, real profits derived from real business activity are shifted around the world through numerous local subsidiaries to take advantage of specific tax loopholes. In one famous case uncovered by the Guardian newspaper, the cartel that controls two-thirds of the global trade in bananas banked more than $50 billion US in sales in one five-year period. But by the time the accounting was done, the total profits on those sales amounted to only $1.4 billion, on which the three members of the oligopoly paid a mere $200 million in tax. Research firm Audit Analytics said recently the amount of profit being moved offshore by U.S. companies has risen by 70 per cent in the last five years and hit nearly $2 trillion in 2013. The scale of profit shifting can be jaw-dropping. In 2012, the Cayman Islands received more foreign direct investment than Japan, World Bank data shows. The amount of genuine economic activity happening in Japan is almost certainly exponentially higher than in the Cayman Islands, but yet there’s more money passing through the latter. 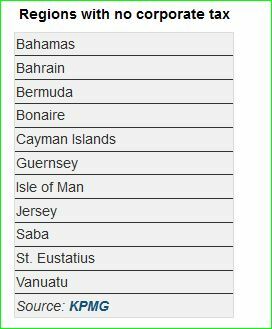 A recent U.S. government report found that a five-storey building in the Cayman Islands, whose only actual tenant was a law firm, was in fact the mailing address for 18,857 foreign companies. In 2013, much of the coverage of corporate tax evasion focused on two giants of the technology industry: Apple and Google. Apple CEO Tim Cook was hauled in front of a Congressional hearing in May to explain how his company managed to avoid paying U.S. tax on at least $74 billion in profits between 2009 and 2012. Cook retorted that with a $6 billion tax bill in 2012 alone, Apple likely paid more U.S. tax that year than any other company, but the bad optics were hard to ignore. Even boring old General Electric booked $108 billion worth of its profits overseas, outside the reach of U.S. tax laws. With eye-popping numbers like that, tax authorities say they are cracking down. Subsidiaries of multinationals colluding to shift money around to avoid tax “should be the situation in which everyone concerned … pounces on it and says ‘You can’t do that’,” tax lawyer Michael Durst told a November 2012 conference aimed at closing tax loopholes. But the fact is most countries play along, and as long as even one country finds it in its best interest to kowtow to a multinational corporation, tax havens will continue to exist. South of the border, there is already a movement afoot to drop the corporate tax rate dramatically to compete with low-tax jurisdictions. Democratic Senator Max Baucus of Montana is sponsoring a bill to that effect, and while such a cut would cost Uncle Sam a lot of money up front, Baucus hopes to recoup some of that by limiting the amount of profit that American companies can keep overseas and still be allowed to do business in the world’s largest economy. The real hope for substantive tax change, Christians says, lies in the rising public awareness of the issue and the kind of protests seen in Britain in 2012 when people questioned why companies like Starbucks were allowed to skimp on taxes at a time when individual taxpayers were facing harsh austerity measures. 1. Should Canada reduce corporation tax to nil? Will this tax measure stop tax evasion, if yes where should we collect taxes from? 2. Why are countries accepting corporations that pay no taxes? 3. What is the solution to paying taxes?